You are here: Home / Meeeooooow! / News / Meeeooooow! More Sarah, why she’s just a pretty face, meeoooow, journalism stuff. I rarely remember my dreams, but for the past week, GOP vice-presidential nominee Sarah Palin has been haunting me. Night after night, she appears in my dreams, always as a scolding, ominous figure. When I mentioned my Palin dreams toSlate colleagues, they volunteered their own. One Obama-supporting colleague dreamed she had urged her young son to kill Palin with a string bean. Another dreamed she was at a fashion show and Palin served her crème fraîche on little scooped corn chips. 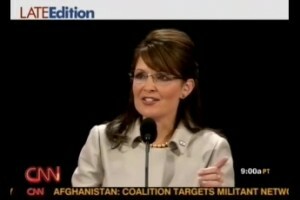 A third says, “In the Sarah Palin dream I keep having, she has superhuman powers but is not really a person at all. Umm … sorry … but I’m just a bitter clinger … what the heck is crème fraîche? Then this is my favorite … from the WaPo duo of Amy Argetsinger and Roxanne Roberts. Go ahead let em know what you think of this investigative work, in the tradition of … well … umm … meeeeooow. https://radioviceonline.com/wp-content/uploads/2011/02/rvo-logo-4-300x100.jpg 0 0 Jim Vicevich https://radioviceonline.com/wp-content/uploads/2011/02/rvo-logo-4-300x100.jpg Jim Vicevich2008-09-09 14:41:532010-11-07 20:19:43Meeeooooow!